Here we report a preliminary test experiment combining the act-cas9 (stock CFD-1) with two different gRNAs targeting yellow expressed from either the U6-2 or U6-3 promoter. 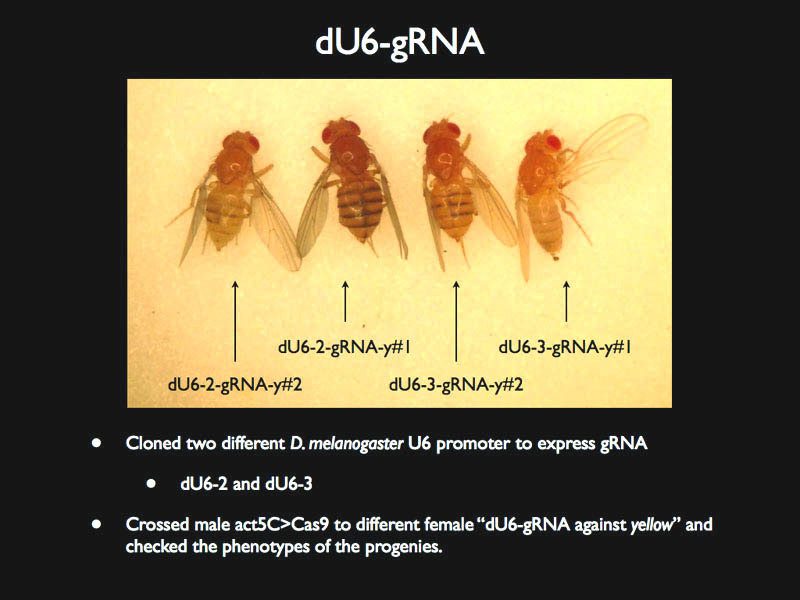 The pU6-gRNAs were stably integrated into the genome and transgenic flies were crossed to CFD-1 flies. Offspring inherit a wildtype yellow allele from the pU6-gRNA parent and a y1 allele from the CFD-1 parent. The two gRNA target sites were: y#1: GCGATATAGTTGGAGCCAGCTGG and y#2: GTGCACTGTTCCAGGACAAAGGG. We scored around 100 female flies of each cross for appearance of yellow body pigmentation. Strikingly, all act-cas9 pU6-3gRNA y#1 had entirely yellow body pigmentation, while all act-cas9 pU6-3gRNA y#2 had a mosaic appearance. Expressing gRNAs from the pU6-2 promoter resulted in weaker mutagenesis, with act-cas9 pU6-2gRNA y#1 flies having wildtype body color and act-cas9 pU6-2gRNA y#2 having mosaic body color. All phenotypes were 100% penetrant. The results described above are preliminary, but indicate that supplying gRNAs from a pU6 transgene can result in highly efficient mutagenesis. We are currently conducting more experiments and hope to soon provide better guidlines on which combination of cas9 source and gRNA delivery method results in optimal targeting. We have now tested for germline transmission of the yellow mutations described above. We crossed 7 females to yellow mutant males and scored the number of yellow offspring. 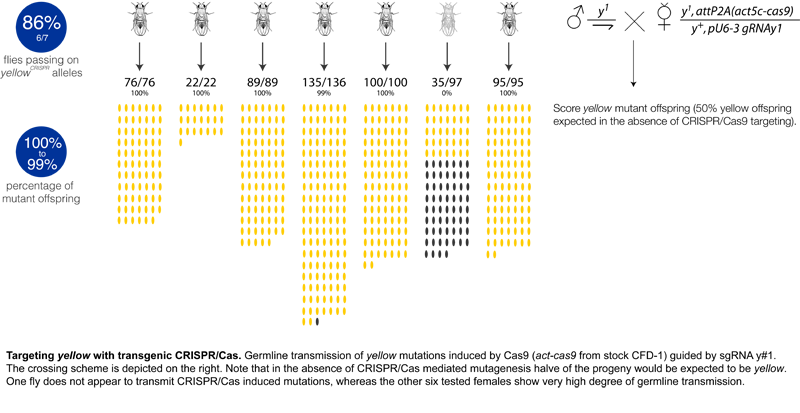 Consistent with the very high amount of somatic yellow mutations in the act-cas9 / pU6-3gRNA y#1 genotype, we found that these flies have germline transmission rates approaching 100%. Surprisingly, one fly did not show germline transmission. The results are summarized in the figure below. We also tested act-cas9 / pU6-3gRNA y#2 females for germline transmission and found that although most flies transmitted CRISPR/Cas induced mutations (6/7), the overall germline transmission rate was lower than compared to pU6-3gRNA y#1 (25%-100%). This is consistent with the lower somatic mutation rate in this genotype (see above).